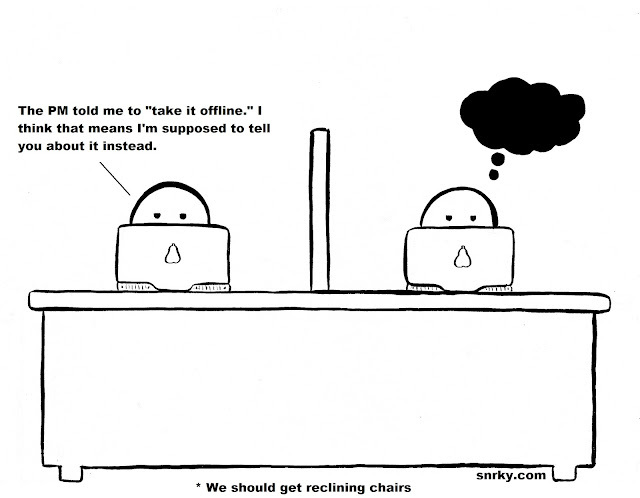 Taking if Offline or "Put it in the parking lot" are common phrases if you do a lot of big company meetings. With a good PM, it truly means follow up discussion. With a less capable PM, it means, let's never talk about that again. A bad PM, let's never talk about that again because I don't understand it. "The big-hit technology companies from the past 10 years tend to have pathetic blogs. Twitter's blog, like Facebook's and Google's, is full of utterly boring press releases rewritten to sound a little bit less stuffy. Apple's employees produce virtually no blogs, even though the company has introduced several game-changing new products in the past decade. Meanwhile, hundreds of Microsoft's employees have amazing blogs, but these have done nothing to stave off that company's slide into stodginess." Snarky: The PM told me to "take it offline." I think that means I'm supposed to tell you about it instead. We can't decor a office or house without furniture. Best quality media furniture and lobby set is most important to decorating a house or office.